Fig. 1. The ‘Tree of Jesse’ window, Wells Cathedral. © Dean and Chapter of Wells. The first phase has begun of a three year programme to conserve and protect the mid-fourteenth-century ‘Tree of Jesse’ window in the choir clerestory of Wells Cathedral (Somerset). Component sections of the custom-milled bronze frame which will support a new externally fitted protective glazing system for the window are currently being manufactured in Germany. This first phase continues before Christmas when the glazing conservator, Steve Clare and his team at Holywell Glass, begin assembling the frames before fixing them in place next year. During the second phase the medieval glass will be removed for cleaning and conservation in 2011 and reinstated in 2013. Recent inspections have shown that some of the lead in the window is bowing and that in other panels the glass is also loose in the leads, predominantly in the lower sections of the lancet lights. More significantly the medieval glass is being damaged by condensation and consequent mould growth. This in turn is attacking the painted layers on the glass. The external face of the glass is also suffering from various degrees of corrosion with, for example, damage more pronounced to the white and flesh coloured glass than to the greens. One possible explanation for these differences may lie in faults in the original manufacturing process, such as impurities in the original materials or shortcomings in the firing of the glass. ‘We are dealing with these problems in new ways’, Steve Clare told Vidimus. ‘Most ventilated protective glazing systems have seen the original glass moved inside the building and replacement external glass fitted into the original glazing grooves. This approach was rejected at Wells for several reasons; the most important being that bringing the glass further into the building would interfere with the shadow lines formed by the historic mouldings around the windows. The system we are using was designed in essence by Dr Ivo Rauch, the eminent German conservator, who was retained as a consultant to the project. Some refinements to the scheme have also been introduced over the past two years as part of an ongoing programme of monitoring, testing analysis and adjustment. An important element of this programme was an environmental study conducted by Dr Rauch to assess the environmental conditions inside and outside the Jesse Tree window. The new system will leave the medieval glass in situ and install a protective barrier of ventilated glazing fitted about 75 mm outside the plane of the exterior medieval window. The bronze frames will be screwed to the stonework. They will incorporate hinged openings enabling regular cleaning work to be undertaken as well as providing easy access to the medieval glass if it needs to be removed for any reason. The window at Wells Cathedral is one of the finest surviving examples in England with around 90% of its original glass intact. The CVMA (GB) author, Dr Tim Ayers has dated the window to 1340. It is known locally as the ‘golden window’ because of the extensive use of yellow glass of a rich golden hue. Images of the Tree of Jesse were popular in the late medieval church. They depict a sleeping figure of Jesse (the root) from whose side a tree or rod sprouts. The Virgin Mary is the rod or stem of the Tree. Kings and prophets appear among the branches. Christ is the flower of the Tree. The Wells window consists of three tiers of figures presented over eight panels in three central lights and two tiers of figures over six panels in the two pairs of side lights. It is described fully in Dr Ayers’ CVMA study of the cathedral glass (Further Reading: Ayers). The image combines the Old Testament prophesy of Isaiah 11.1–5; ‘There shall come forth a shoot from the stump of Jesse, and a branch shall grow out of his roots. And the spirit of the Lord shall rest upon him’, and the list of human ancestors of Christ listed in the New Testament gospel of St Matthew 1:1–17. In the Latin Vulgate Bible used in the Middle Ages, Isaiah’s prophesy was translated as: et egredietur virga de radice Iesse et flos de radice eius ascendet or ‘.. a rod out of the root of Jesse, and a flower shall rise up…’. Virga means a ‘green twig’, ‘rod’ or ‘broom’ providing the ancient pun between virgo and virga , which Dr Arthur Watson (1863–1954) has suggested was at the heart of the development of the image (Further Reading: Watson). In the New Testament the lineage of Jesus was traced by two of the Gospel writers, St Matthew and St Luke. St Luke describes the ‘generations of Christ’ in Chapter 3 of his Gospel beginning with Jesus himself and tracing backwards through his ‘earthly father’ Joseph all the way to Adam. St Matthew’s Gospel opens with the words: ‘the book of the genealogy of Jesus Christ, the son of David, the son of Abraham’. A. Watson, The Early Iconography of the Tree of Jesse, OUP, London, 1934. Fig.1. The Annunciation by Agnus Drapeir. Fig. 2. The Assumption of the Virgin by Agnus Drapeir. An exhibition of six medieval panels from the fourteenth to sixteenth centuries currently undergoing restoration in the studios of the Vitromusée, Romont, Switzerland, has been extended until 26 September. 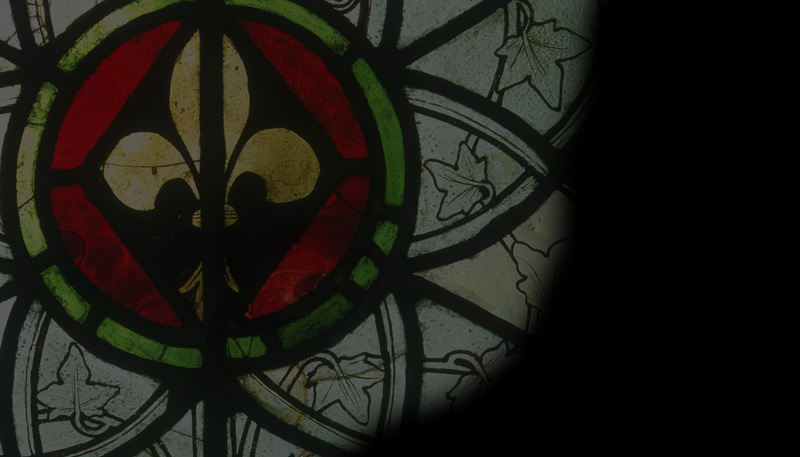 The glass comes from the collegiate church of Our Lady in Romont and ranks among some of the most important in Switzerland. One fourteenth-century panel shows affinities with the windows at Königsfelden Abbey while panels showing the Annunciation and the Assumption of the Virgin were made around 1455 and are the work of Agnus Drapeir, a glass painter who was also employed at Lausanne cathedral in 1466. Visitors to the exhibition can see the conservators at work in the studio. For more information see the Vitromusée website. Fig. 1. Noah’s ark afloat, (nII). The German CVMA (Potsdam) has created a superb websiteabout the medieval stained glass windows of St Mary’s church, Frankfurt-an-der-Oder. As with their other productions, the site includes zoomify technology to enlarge images of every panel. Dating from around 1370, these important windows show scenes from the Book of Genesis (nII), a typological pairing of scenes from the Old and New Testaments depicting the Life of Christ (I) and a unique Antichrist cycle (sII), representing events/moments from the End of Time. Fig. 2. The Circumcision of the Antichrist (sII). Further Reading: Vidimus 11, News; Vidimus 15, News; Vidimus 19, News; Vidimus 24, News; Vidimus 29, Book Review. Fig. 1. Visitors enjoying the exhibition. © Antoni Vila Delclòs. Our May issue (Vidimus 40 ) featured an interview with Joan Vila-Grau who, in collaboration with Antoni Vila Delclòs, is designing the stained glass windows in the church of the Sagrada Família in Barcelona. There are already thirty-five windows in place in the church. These include windows in the apse and on the Nativity and Passion facades. An exhibition devoted to these windows, organised by Antoni Vila Delclòs, Executive Director of the Corpus Vitrearum in Catalonia, opened on 5 August and will continue until 30 September. This elegant and informative exhibition takes visitors on a journey from the initial water-colour designs and selection of coloured glass in Joan Vila-Grau’s studio, to the construction of the window in the glass-maker’s workshop and the installation of the completed window in the church itself. The exhibition offers a unique opportunity to observe the delicate and complex development of a stained glass window and the creative sensitivity needed to harmonise all the windows in this unique scheme. More information is available on the Sagrada Família website. Fig. 1. Detail of St Christopher and the Christ Child, nVI, 4b, St Michael-le-Belfry. © Gordon Plumb. 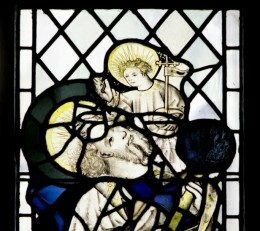 Two leading US Scholars Drs Mary B Shepard and Lisa Reilly, FSA, are preparing a major study of the stained glass of the parish church of St Michael-le-Belfry, York for the CVMA (GB). Three of the windows of this late medieval church were the subject of Reilly’s 1979 MA thesis at the University of York and earlier this year both authors were visiting scholars at the Centre for Medieval Studies at the University of York. Fig. 2. Detail of the Marriage of Gilbert Becket and a Moorish princess, nV, 3d St Michael-le-Belfry, c. 1530. © Gordon Plumb. This is the first time that this important glass will have been properly studied. Dr Mary B Shepard is on the faculty of Friends University, Wichita, KS USA and is the secretary of the American Committee of the Corpus Vitrearum. She has published on French and English stained glass, as well as nineteenth-century collections and installations of medieval stained glass. She has also been a Vidimus contributor. Dr Lisa Reilly is an associate professor and director of Graduate Studies at the University of Virginia and the current editor of Gesta, the Journal of the International Centre for Medieval Art based at the Cloisters Museum in New York. Dr Reilly’s previous publications include a monograph on Peterborough Cathedral. Apart from the medieval glass in the church, a splendid late nineteenth-century window depicting the four archangels by the well-known York stained glass artist and conservator, J.W. Knowles, is installed at the north-east corner of the church. 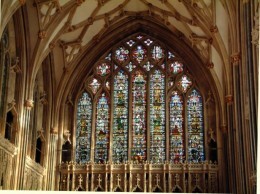 A second Victorian window was once installed on the south side of the church –opposite the Minster, but it was destroyed during the restoration campaigns following the Second World War. Do any Vidimus readers have a picture of this lost window? If so, Drs Reilly and Shepard would be very happy to hear from you! Please write to: news@vidimus.org if you have any information. Fig. 1. Christ crucified on a Lily cross, the Clopton chapel, church of The Holy Trinity, Long Melford. © c. b. newham. Vidimus editor, Anna Eavis, will be among the speakers at a special Monumental Brass Society study day at the parish church of the Holy Trinity at Long Melford, Suffolk, on Saturday 25 September. Anna will speak about the important fifteenth-century windows in the church. Early booking is essential with places allocated on a first-come first-served basis. The cost, including coffee and tea, but not lunch, is £18.00 for members and £25.00 for non-members. Please make cheques payable to the Monumental Brass Society and send to: H. Martin Stuchfield, Hon. Secretary, Monumental Brass Society, Lowe Hill House, Stratford St. Mary, Suffolk CO7 6JX. Email: martinstuchfield@btconnect.com. Telephone: 01206 337 239. The Stained Glass Museum at Ely Cathedral has announced details of its Autumn one-day courses. All workshops are suitable for beginners. Materials and tools will be provided. To book a place, ring the Museum on 01353 660 347. For more information see the Stained Glass Museum website. Fig. 1. Name that Roundel! © YM Pictures. This month’s puzzle is an oval from a north aisle window (nIII 1b) in the parish church of St Mary at Addington in Buckinghamshire. It measures 24cm x 18.5cm and is surrounded by a Victorian decorative border (not shown). It has been dated to c.1550. The panel shows a group of people standing to the left of what seems to be a circular building with a pediment above the door. Steps lead up to it. The scene is dominated by a young man offering food to a strange creature. The beast has spots, wings and talons. It is unchained. To the young man’s left, the upright figure of a crowned king holding a sceptre watches the event..
What scene does it show? Roundels and other single panels of this period typically depict a range of subjects, including stories from the Old and New Testaments, the Lives of saints, and tales from ancient history and classical literature, such as Homer’s Odyssey. Moral themes can also appear. The solution can be found at the foot of this month’s Books section. Friday 15 October: BSMGP Autumn Lecture 6.15 for 6.45pm, Tom Denny – ‘Recent windows in extraordinary buildings’. For more information see the BSMGP website. Monday, 15 November: Worshipful Company of Glaziers Lecture, 6. 45 p.m. Painton Cowen – ‘Lesser known Medieval masterpieces in England and France’. For more information see the Worshipful Company of Glaziers website. Wednesday 15 September: 2010 conference of the Stained Glass Group of the Institute of Conservation (ICON) at the Cripps Auditorium, Magdalene College, Cambridge. Speakers will discuss ‘Colleges, Parishes & Villas, Stained Glass Conservation in the South of England’ and include Martin Harrison, Prof. Joost Caen, Prof. Sebastian Strobl (Germany) and Elise Learner (France). Non-members are welcome. Lunch is included in the delegate fee of £78 for ICON members and students, £88 non-members. For further details and information about booking please contact Peter Campling at peter@mcleadglaziers.co.uk or phone 01603 891505. Until 3 October: Swiss Stained Glass, 16th to 18th Century from the Hermitage Collection, State Hermitage Museum, St Petersburg. 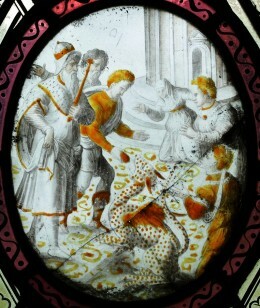 Until 2 January 2011: Medieval Glass for Popes, Princes and Peasants at The Corning Museum of Glass, Corning, New York. This is an exhibition of vessel glass. For more information see the Corning Museum website. Until 6 February 2011: Illuminated Manuscripts from Belgium and the Netherlands, Getty Museum of Art. Until 2013: Vitraux de la Renaissance à Chartres at the Centre International du Vitrail, Chartres. For more details see the Centre International du Vitrail website. From 6 October – 17 January: Man, Myth, and Sensual Pleasures: Jan Gossart’s Renaissance, at the Metropolitan Museum of Art, New York. From 17 October 2010 – 17 Jan 2011: Treasures of Heaven: Saints, Relics, and Devotion in Medieval Europe, the Cleveland Museum of Art, Ohio, USA. From 6 November 2010 – 27 February 2011: The Glory of the Painted Page, medieval manuscript illuminations from the permanent collection of the Cleveland Museum of Art, Ohio, USA. From 16 November 2010 – 6 February 2011: Imagining the Past in France, 1250–1500, Getty Museum of Art. From 13 Feb – 5 August 2011: Treasures of Heaven: Saints, Relics, and Devotion in Medieval Europe at the Walters Art Museum, Baltimore. From 16 February – May 2011 : Man, Myth, and Sensual Pleasures: Jan Gossart’s Renaissance, National Gallery, London. Curated by Maryan Ainsworth; with catalogue. Previously at the Metropolitan Museum of Art, New York (see above). From 23 June 2011 – 10 September 2011: Treasures of Heaven: Saints, Relics, and Devotion in Medieval Europe, at the British Museum, London.